Until today, Joaquin “El Chapo” Guzman had been on the run since making an outlandish tunnel escape from a Mexican maximum security prison last July. Although there have been false alarms as to his capture since then, today he is a free man no more. And he was packing some very serious heat before the authorities took him in. You can see him about to be carted off in a truck in the video above. Once at a nearby airport, he was unloaded from the truck and brought aboard a waiting Learjet. The raid went down at a house located in the city of Los Mochis, in El Chapo’s home state of Sinaloa. A gunfight ensued, with five of El Chapo’s gang killed and six others captured, including Guzman himself. Some may still be on the run including one of El Chapo’s top lieutenants. Apparently an number of Mexican Navy operators were also injured in the firefight. 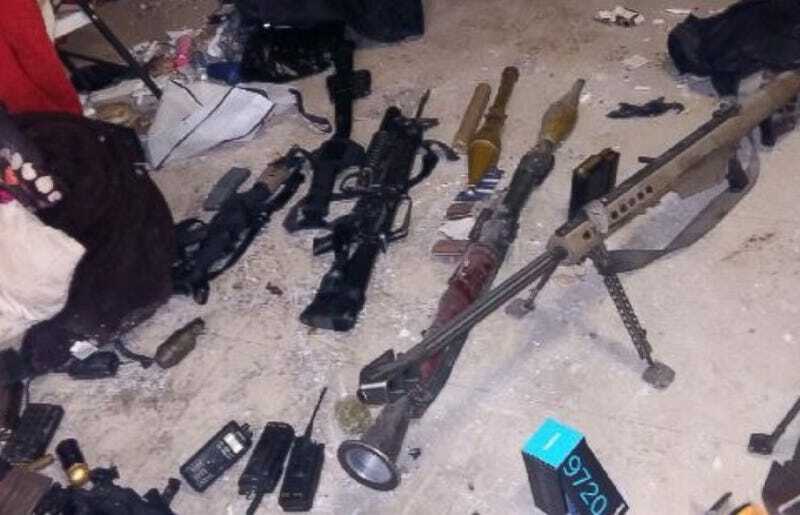 Pictures released by the Mexican Navy show the armament found in the seized home, and it looks like a scene out of Scarface. Clearly the Cartel boss was not planning on going down without a fight. The arsenal includes 50 caliber rifles, rocket-propelled grenades, and an M-16 with a grenade launcher attached, as well as an assortment of radios and flashlights. In total, the Mexican Navy reports nine guns were found as well as the rocket launcher. Reports state that DEA intelligence led to El Chapo’s capture, although this has not been officially confirmed. Nor has the location where El Chapo will end up now that he is once again in Mexican police custody. Is there really a cell in Mexico that can hold Guzman? So far, the answer is no, at least in Mexico. The country’s track record for keeping him incarcerated is pretty abysmal. With this in mind, it will be interesting to see if this time the drug kingpin will end up being extradited to the United States for safe keeping.